I am a collector of anything and everything Kate Spade. I just find her merchandise so pretty & classy. I love her colors! And she has very reasonably priced jewelry. I like her stuff too. Do you collect like bags, clothing, jewelry? Anything specific? I really love her bags but it is really anything and everything Kate Spade. I added a coffee mug to my collection a few days ago. Cute! Post a pic of it! Thanks for saying that. It’s really what provoked me to write so damn much about my bracelets because they are so connected to him. You are so sweet, all the time, with your comments. I can totally understand a desire for a bird collection. I needlepoint and often the bird canvases are the ones I’m drawn to. Thanks, that’s a Canadian brand blanket! It’s so sweet to see in the photo also the bracelet that your niece have made for you! I have a massive collection of Batman and Wonder Woman Statues, figures, comics and anything else I can find with their images on it. Problem is I have no room left for anything new … yet I still can’t help but buy more! That’s interesting, are the statues only Batman and Wonder Woman? I find it so interesting the rules we make for ourselves regarding collections. I do have some others, but I would say at least 80% are of Bats and Wondy. Love the characters and just have to buy anything I see with them on it. I love all the things I have purchased of course, it’s really just the fact of running out of storage space for the various boxes and packaging. I bet there’s some job out there like a closet organizer but a collection organizer. I definitely struggle with a way to “display” my collection in a way that I can see everything but it still protects the bracelets. Storage + presentation are definitely the biggest challenges of having a collection. Gorgeous collection! I really love how each of them has a special little story behind them…makes your collection all that more special. And the 3 that doesn’t? Well, I still think they say something about your style. 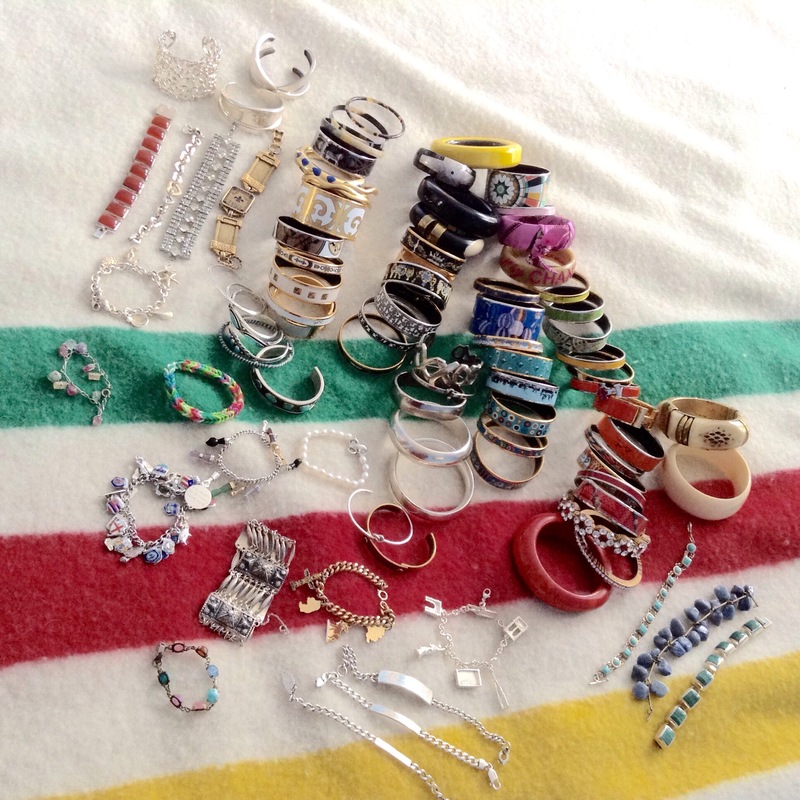 I mean…there are a bajillion bangles out there and yet you chose those 3 to keep. That’s special! I don’t have a collection per se…I have a problem. I collect a lot of makeup stuff and currently, I have easily over 100 lipsticks. And that’s without cheating and counting glosses or liquid lipsticks. I seriously have enough makeup that can be willed to my descendants for generations to come. Considering makeup expire, I think I need to pause and chill out a bit with this stuff! I’m convinced “makeup expiration” is a myth of the makeup industry to get us to buy more stuff. It’s so hard to throw out makeup!! I am always like “well I need to keep this purple blush in case I need to dress up like a zombie. And this gold eyeshadow in case I’m invited to a disco party.” When do these things happen? Never. That just means we need to throw a zombie disco party when we meet up…that is the most logical solution I can think of. And I totally know what you mean about the expiration dates being a myth. I keep hearing people say that you know your lipsticks expire when their smell changes – and I swear I have lipsticks from 10+ years ago that still smell and feel the same. I think the one concern would be bacteria growth, like if you get an eye infection and continue using the same mascara. But I keep all my brushes clean and mascara I replace regularly. I guess lipstick you can just chop off the end, right? Your dress collection is inspirational!! How do you store all of them? In your closet, or do you do something special? Pictures!! I want to see pics! Tho I do love that last series of instagram shots with a bunch of them laid out. Hehehe thank you! I do need to take a closet tour once I get it all organized and color codes like I want! Hehe. How do you store all of your jewelry?